Sure-Seal™ saturated foam sealant tape for HVAC is a compressible foam tape that combines the sealing power of closed cell tapes with the flexibility and conformability of open cell foam. This innovative foam sealant replaces caulk, spray foam, putty and other liquid sealants used in HVAC. Typical sealants can be messy and difficult to apply, but Sure-Seal conveniently seals out air and water infiltration for over 20 years. Sure-Seal™ impregnated urethane foam stops air, vapor, moisture and dust penetration in HVACR systems. Use foam sealant tape to seal around air filters, access doors and panels, roof curbs, service doors, heating and air conditioning unit installations, refrigeration systems and more. Sure-Seal™ foam sealant tape is a convenient, time-saving solution that replaces common liquid sealants and lasts for 20 years or more. Simply peel the foam away from the paper backing and press it into place, taking care not to stretch the tape. 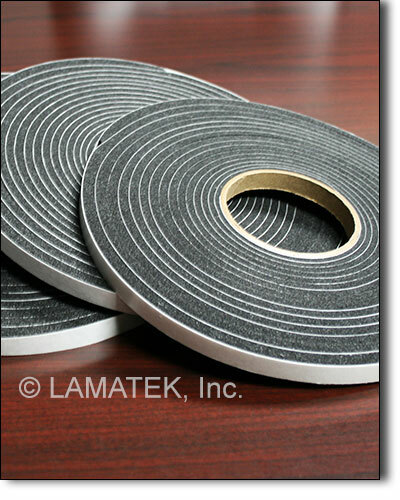 Sure-Seal™ foam sealant can be supplied in rolls of tape or custom cut gaskets. Tapes are available from 1/4” to 1-1/4” thick, 3/16” to 39” wide and wound on a 3” core tube. Saturated foam sealant tapes come standard with a paper liner on one side. Custom die-cut Sure-Seal™ gaskets are available for sealing specific areas of your HVACR systems. Our team of experts will work with you to create the perfect gasketing solution for your application. Custom sealing gaskets are supplied kiss-cut on a roll with the matrix removed or left intact for your convenience. Sure-Seal™ foam tape is made from a resilient, open cell urethane foam that has been impregnated with a proprietary saturant to provide superior sealing qualities without the compression set or restrictions of typical closed cell foams. Say goodbye to tedious, messy sealants and switch to our innovative saturated foam today.